Is this what the Note 8.0 looks like ?? Today we recieved a Tip through twitter with what looks to be a picture of the upcoming Note 8.0. Yesterday J.K Shin confirmed the Note 8.0 for MWC and today we have a picture to show you. The Galaxy Note 8.0 uses a 1280 x 800 Super Clear TFT screen and has a 1.6 Ghz Quad Core Processor. It runs Jelly Bean straight out of the box. Dimension: 211.3×136.3×7.95 mm , 330 gram. 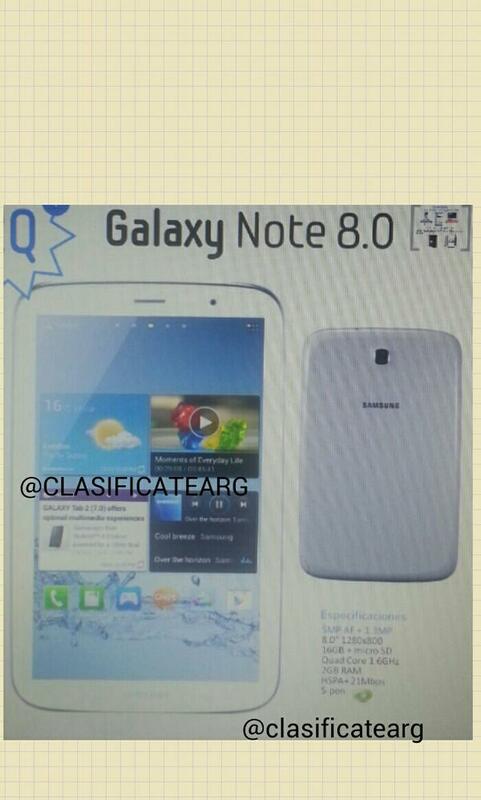 Sehen wir hier das Samsung Galaxy Note 8.0? Not too sure about this….why does it use the Spanish term for specifications (especificaciones) but the screen image is English? Why does the screen show the weather for London and not Madrid? Why is the screen the same screen used to promote the Samsung Galaxy Tab 2 7″? And the screen ratio seems to be 16:10? Hmmmm….not too sure…. @mX87m, because u can make call….look closely, there is icon of Call(Phone) on the left of bottom. @msedek, if u look more harder on the left side device of bottom, there is s-pen slot. The front looks ok, mini nexus 10, bit the back cover looks cheapo, the design feels like a large note II and that is not a good thing, If only sony added something like an s-pen to their new xperia tablet z, I would be set for a purchase. Also, check the music player, us fellow sam tab guys will notice ; yes it has ringtones and UI sounds in the music player; brilliant coding. while Im glad to see the the phone icon, that appears to be ICS not JB. Also, its not like samsung to have 2 such mis-proportinate photos. No Flash?? with or without s-pen? when it is called note! ? i aggree. —-> spen slot is on the bottom left. Just look closer man, spen slot is on the bottom left.